retention of the lower denture. but only when the patient wants it removed. a small trade-off for a large amount of security. One of Prosthodontics most difficult restorations is the Combination Case.....an upper denture opposed by a group of crowns and a removable partial denture. These cases require careful planning and coordination with the supporting laboratory to produce results that are functional as well as esthetic. Well-made temporary restorations maintain the patient's bite and comfort during treatment. 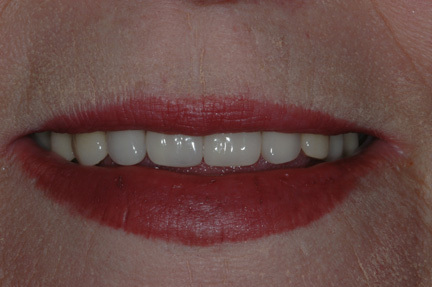 An upper complete denture opposed by four crowns and a removable free-end partial denture. The case was completed with porcelain teeth set in custom tinted acrylic resin. I-bar clasps are used on the lower partial to reduce stress. An upper denture opposed by four crowns and a removable precision-attachment retained free-end partial denture. The Dalbo precision attachments maintain the partial denture in place without any display of metal clasps. A complete upper denture with porcelain teeth set in custom-tinted acrylic resin opposes a lower arch with all of the remaining teeth restored with porcelain crowns, Dalbo precision attachments and a free-end partial denture. Porcelain bridgework on seven lower teeth with Dalbo precision attachments retain a free-end partial denture and oppose a complete denture fabricated with porcelain denture teeth and custom-tinted acrylic resin. Implant retention of the upper denture is the best means of providing patients with the security and comfort needed to eat and speak naturally. Locator® implant abutment heads placed in the upper edentulous jaw are specially designed to take up a minimal amount of space while providing exceptional retention of the upper denture. 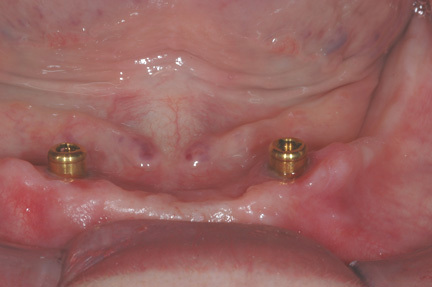 Metal housings embedded in the upper denture hold nylon "snaps" that provide secure retention. The snaps come in a variety of strengths to satisfy most patients' needs. Implant retention of the upper denture eliminates the need for messy denture adhesives. 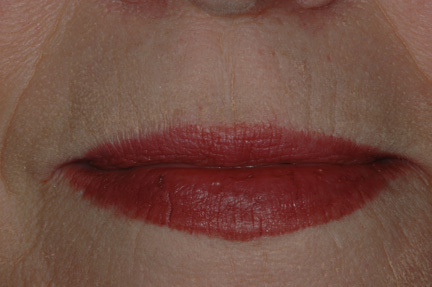 Old dentures that do not properly support the lips can accentuate age lines and make application of lipstick difficult. 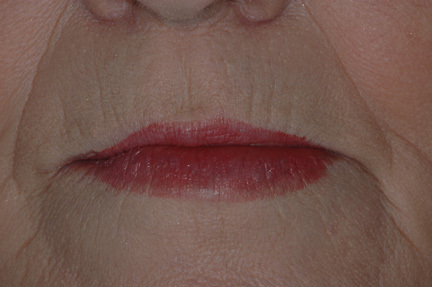 Worn, broken or poorly positioned denture teeth offer little support for lip tissues. 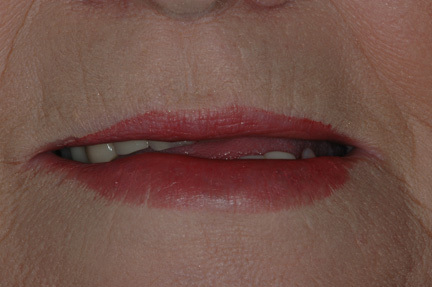 Properly positioned denture teeth provide adequate support of the lip tissues and give the patient a natural look. Proper lip support smooths out age lines and makes application of lipstick easier and more effective.